Let’s start with Starbucks. Starbucks argues that its customers do not buy coffee from Starbucks only for having coffee; they buy it because they want the “Starbucks experience”. The company says that every cup of coffee is sold on back of the “Starbucks” brand, and therefore, a portion of the profit made from every cup should be attributed to the brand. Based on this argument, Starbucks first formed a subsidiary in a country with zero tax rate, and then transferred the rights to the “Starbucks” brand to this subsidiary. Now every time a cup of Coffee is sold, the main Starbucks Company pays a portion of profits to this subsidiary based on the pretext that we are paying this subsidiary for using the “Starbucks” brand which this subsidiary owns. Why is Starbucks doing this? To avoid taxes! Starbucks only has to pay tax on the profits made by the main company while the profits transferred to the subsidiary go untaxed because the entity is based in a country/jurisdiction which charges 0% tax. All such jurisdictions which allow for 0% or exceptionally low tax rates are called tax havens. 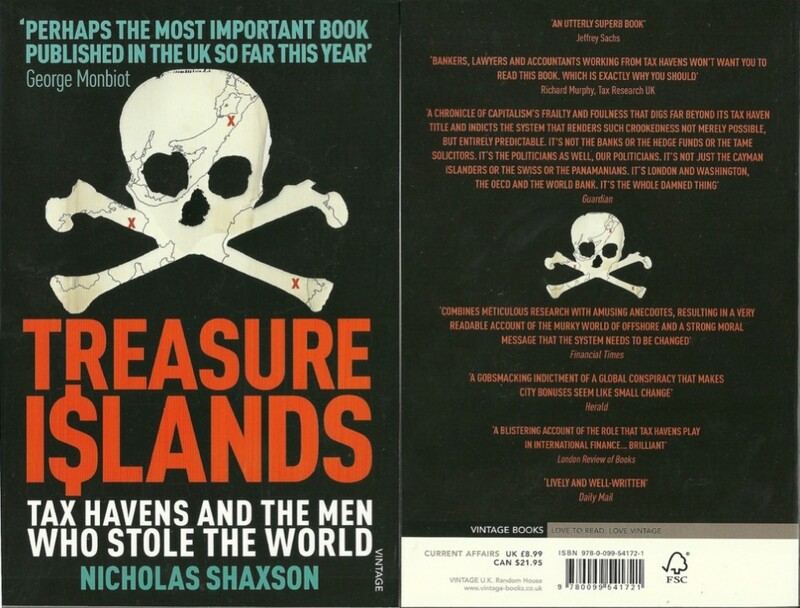 Many surprising, interesting and eye opening uses of tax havens by Starbucks, Warren Buffet, Fox News, international trade, and corrupt politicians in developing countries are compiled in the book “Treasure Islands”. The book is primarily focused on highlighting the use of tax havens by wealthy family houses and corporations around the world to avoid paying taxes. The book is written by Nicholas Shaxson who is a journalist and an associate fellow of the Royal Institute of International Affairs, but more importantly, he is a researcher for the Tax Justice Network. And it is his affiliation with this network that lead to the publishing of this book. The tax Justice Network was launched in 2003 and they are focused on a lot of issues related to tax, tax havens and financial globalization. – The author starts by explaining that tax havens are legal jurisdictions that allow their local laws to help corporations and individuals avoid taxes and regulations in their home countries. He explains how widely the tax havens are being used around the world for saving taxes, moving assets across borders, and even for financing weapons trades. – Apart from saving tax, the primary purpose of using tax havens is secrecy. Laws and regulations in tax havens, which permit secrecy and limited reporting, allow entities in other countries to keep their funds without disclosing the source, the amount or use. In order to facilitate the clients, tax havens do not provide any data to authorities of any other country. Even in extreme cases, where such tax havens are required to disclose information to international authorities, they ensure their client that the money would be protected. – With the increase in competition among tax haven jurisdictions, the magnitude and flexibility of their services has also increased. One of the premium services provided by some tax havens is “flee clause”. If your service includes a flee clause, the tax haven will automatically move your money to another tax haven if Interpol/other legal authorities come to investigate. – In addition to tax havens, organizations and individuals also use legal entities called “Trust” to avoid taxes. Trust is a legal entity that has a particular purpose which can vary from one Trust to another. The person who puts money in a Trust is called the Owner. A professional manager (normally a lawyer) manages the trust and is called the Trustee. As per most of the tax jurisdictions, the trustee has the power to not disclose to the tax authorities that who is the owner or beneficiary of a particular trust. This allows entities to cover the trail of funds, intergenerational estate transfers and in some cases, movement of cash across borders. – The most shocking fact that this book pointed out is that more than half of the world’s trade flows, at least on paper, pass through the tax havens. – The author also points finger at News Corp – the holding company for Rupert Murdoch’s media empire that owns Fox News, Myspace and the Sun. An investigative journalist Neil Chenoweth reports that News Corp reported profits of only AUD 363K, AUD 464K and AUD 496K during 1987-1989. For a huge organization like News Corp, these numbers are just peanuts. – Those in favor of tax havens argue that such jurisdictions support healthy tax competition and the secrecy provided by them helps in protecting money. – However, the author believes that competition in tax laws between a tax free jurisdiction and taxable jurisdiction does not even make sense. Tax haven simply allows the rich to use all the facilities provided in the country without paying the taxes. – Moreover, the author argues that tax rates in developed economies do not impact competition. The main areas which determine how attractive a country is are education, institutional strength, economic and political stability. To support his argument he refers to World Economic Forum which also focuses on these four metrics to determine the competitiveness among nations and interestingly, Finland, Sweden and Denmark – countries with highest tax rates in the world – are ranked fourth fifth and sixth in the WEF’s competitiveness index. – When arguments for secrecy and tax competition fails, proponents for tax havens point at how such tax havens have helped people in distressed times. For example, Daniel Mitchell, a strong supporter of tax havens, points out how Switzerland provided a safe place to store undisclosed assets for the Jews during the third Reich. However, the author of the book rejects the argument due to lack of historical evidence. The author argues that the Swiss law that allows banks to keep their customers’ information secret was proposed in 1932, a year before Hitler’s reign. Moreover, the law was passed in 1934 two years before Hitler announced the death penalty for owners of undeclared foreign assets. – Some people favor tax havens thinking that they provide shelter to hard earned money from changing political landscape of the country which might victimize the supporters of opponent parties. – In addition, some naive people think that such jurisdictions are at least good for the residents of that area because they do not have to pay taxes on their earnings. Interestingly, this is not true. The tax havens provide tax shelter only to non-residents. The residents of the tax haven have to pay normal taxes at high rates. And to justify this anomaly, the tax haven apologists argue that world cannot function without taxes and if no one pays taxes in these areas, how can the government function. – Tax havens are instruments only at the disposal of the wealthy. The lawyers, accountants and tax professionals who help their clients managing their money charge such high fees that only the rich can afford them. Moreover, tax havens have minimum limit for deposits. For example, most of the banks used to ask for a minimum deposit of EUR 3.0 Million at the time the book was published. – Tax havens are primarily being used for accumulation of wealth, which lets bigger corporations to have an unfair advantage over smaller businesses. Sadly, the accounting standards used around the world also allow for such treatments. – The concept of deferred tax in accounting is one of the favorite tools used by large corporations. In simple words, a large multinational organization only has to pay tax on the profits made internationally when the profits are sent back/repatriated to the country of parent organization. However, instead of sending money back to the home country, these organizations transfer the profits to tax havens, thus avoiding tax. Though they will have to pay tax whenever these profits will be sent back to the parent company in future, but until then, all of these profits are available for these companies to use, just like an interest free loan from the government. – Warren Buffet, the most celebrated capital markets investor, pays lowest tax rate in his office. Yes! His tax rate is lower than even his receptionist. – In order to track the tax havens and their practices, the Tax Justice Network decided to launch an index called Financial Secrecy Index in 2009. The published index surprised general public when they saw United States of America being regarded as the world’s most important secrecy jurisdiction. Other obvious names on the list were the UK, Cayman Islands, Switzerland and Luxembourg. – The author discusses the history of tax havens in America. He says that the first bold stance against the tax havens was taken by the Carter administration who published the world’s first survey on such jurisdictions, called the Gordon Report. During their final month, this administration condemned the use of tax havens and called for a global crackdown on such practices. – However, as Ronald Reagan came into power, the Gordon Report was ignored and he camouflaged the whole issue by supporting lower tax rates. Later on the Clinton administration tried to raise the issue again by proposing that banks based in OECD countries should report the deposits of their clients. However, the bush administration again put a lid on it in name of lower taxes. President Obama once publically criticized the use of Cayman Islands for tax havens. The chairman of Cayman Islands’ Financial Services replied back by asking Obama to focus on Delaware first. – The most famous tax haven for both local and international groups in the US is Delaware. In Delaware, you can make a company with less than thousand dollars and you are not required to provide any details of the business, its source of income or its ownership. The agents based in Delaware serve as the corporate address for thousand shell companies at a time. And since most of the agents are lawyers, they normally withhold information from authorities citing attorney-client privilege. – The author explains how the most comprehensive system of tax havens is based in the UK. The tax havens in UK were created to facilitate strong political relationships maintained by the British government with countries all around the world. Prominent families, political parties and military regimes around the world are supported and controlled through the use of such tax havens. First the corrupt leaders are attracted to put their money in these low tax secret jurisdictions and then the same assets are used to control the interests of british government. – There are three layers of the tax haven system in the UK. The first layer is made up of three jurisdictions: Jersey, Guernsey and the Isle of Man. Though these areas are formally under the control of UK, but they are granted independence in a way that UK does not have to assume any responsibility for the assets held there. The second layer is made up of 14 overseas states, including The Cayman Islands. The Cayman Islands are world’s fifth largest tax haven. The third weaker layer includes jurisdictions like Hong Kong, Singapore, and the Bahamas. – These layers essentially aid in hiding the source of funds and are the most effective tool for money laundering around the world. Money from any source be it guns or drugs can be funneled into any country by routing it through this web of tax havens. This system of tax havens deployed by the UK is so huge that some economists believe them to hold over half of the banking assets in London and a third of banking assets around the world. – Use of tax havens is wide spread in developing countries as well. There, it is mostly used by corrupt politicians, who first steal the money from the government through corruption, and then channel them into these tax havens. – This phenomenon of transferring money from developing countries into tax havens is termed as “capital flight”. According to Global Financial Integrity report, the total capital flight from all developing countries in 2008 was over USD 1.2 Trillion (latest report from 2015 reports USD 1.1 Trillion in 2013). This number is higher than the total debt or development assistance provided to developing countries by the international lenders like IMF and World Bank. Full table can be found here. – As per another study published by University of Massachusetts Amherst, the total capital flight from 40 countries in Africa between 1970 to 2004 was 2.5 times their international debt. This effectively means that African countries are actually lenders to the world as their external assets are greater than their foreign debt. – Another interesting example of use of tax havens is Argentine. In 1990s, the government bond of Argentina yielded up to 45% on its international debt. Shockingly, most of the bonds were owned by offshore companies with Argentinian owners, rather than international investors. These Argentinian owners were government officers who knew that the debt will be serviced as they were the one making the decision whether to default on the obligations or not. – Such tax havens are being widely used around the world to make investments. For example, the biggest source of foreign investment in India in 2007 was not any developed country, but Mauritius, which is a small tax haven jurisdiction. Based on this brief review of the book, do you think Tax Havens should be legally allowed?